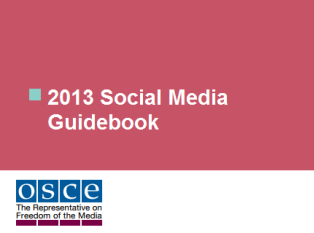 The 2013 Social Media Guidebook explores the potential and the challenges of social media and the right to freedom of expression as new media develop. The authors Christian Möller, Marissa Moran, Douglas Griffin, Andrei Richter, Anna Kachkaeva, Ross La Jeunesse et al. address contemporary issues affecting journalism and media in general. It is an assessment of the potential and the challenges of social media and how it relates to the rights of free expression and free media. In articles and specific case studies this Guidebook lays out the field of social media and its effect on journalism. A summary of the findings is also published in the current edition of IRIS – Legal Observations of the European Audiovisual Observatory (Strasbourg, April 2013, ISBN 978-92-871-7662-2). The publication is written for journalists,consultants, regulatory officials and undergraduate and graduate students. A PDF version of the book is available at www.osce.org/fom/99563. Also available in Russian under www.osce.org/ru/fom/99564. Printed versions can be obtained free of charge from the Office of the OSCE Representative on Freedom of the Media.